The many responses to Freedom magazine (published by the Church of Scientology) from local Clearwater residents show that our readers are interested in Clearwater and want to know more about it. Many residents expressed an interest in the colorful history of our city. Thus, Freedom magazine printed a multi-part series on the history of Clearwater, covering the discovery of what became known as Clear Water Harbor by early settlers through World War II. Because of the overwhelmingly popularity of that series, we are reprinting it in full on these web sites. 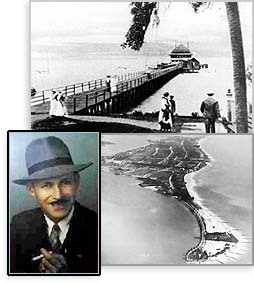 In addition to taking some 60,000 photographs, such as this 1940 aerial view of Clearwater Beach (bottom right), Arlos Ogg (bottom left) collected many others, like the view above of the 1902 recreational pier. J. Arlos Ogg, the official Clearwater photographer for many decades, is one of the individuals most responsible for preserving the heritage of the city. In this interview, he reminisces about his life and offers insights into the Clearwater of today, including why it is so named. Four years after Arlos Ogg employed his first unwieldy camera, a large box Brownie, his parents moved to a farm in Brooksville, Florida. Ogg was only 11 at the time, but he had already learned to drive four-horse teams hitched to gangplows, and to build a house from the foundation up.